Start 9am to noon, finish by 3pm. 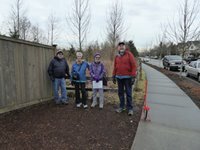 Walk the trail in this brand new park, then on sidewalks and trails of the city of Fife. Sanction 113572: 5K (3.1 miles) & 10K (6.2 miles) routes rated 1A. Dogs fine, but not in buildings. They must be on leash and owners cleanup. Water and restrooms at the start/finish. Special Programs: AVA: Make a Wish at a Water Fountain, Take a Walk in a City Park. From I-5: Exit #137 NORTHBOUND RIGHT/ SOUTHBOUND LEFT onto 54th Ave E. Veer LEFT onto Valley Ave. E. RIGHT into park parking lot.